Why Doesn't The GOP Reclaim Frederick Douglass? Why Doesn’t The GOP Reclaim Frederick Douglass? Considering that Douglass, who still stands as America’s original – and most effective – civil rights leader, was a key inspiration in founding the Republican Party and a relatively chronic officeholder under Republican presidents in the post-Civil War era, and considering Douglass’ oratory and writings mark him as one of the most articulate defenders of the American ideal to this day, it’s an item of inexplicable stupidity that a party which is now casting about for an entry into the political mind of the black community wouldn’t grab him and put him to use. That video comes courtesy of the Frederick Douglass Republicans, an organization devoted to promoting his legacy. Douglass has been largely forgotten in American culture, save for the appearance of Frederick Douglass characters in the films Glory and Amistad. Among black historical figures he’s been trumped by Malcolm X, which is ridiculous – Douglass, born a slave and facing 19th-century institutional racism, fought against far worse odds and adversity than Malcolm X ever did, and Douglass’ philosophy was far more radical. And more, Douglass didn’t need to withdraw from American society – Douglass succeeded greatly in it. On his death, he had amassed a fortune worth $25 million in today’s dollars as an inspirational speaker, publisher and entrepreneur. 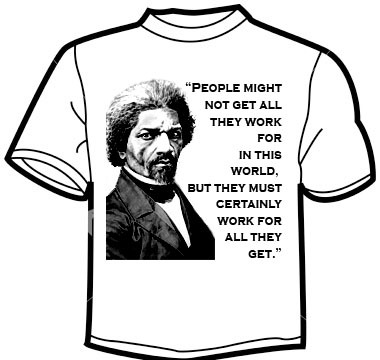 Douglass embodied virtually everything the modern conservative movement embraces. He hated the concept of black dependency, rejected the racist assumption that the color of a man’s skin should dictate his destiny and recognized that education, skill and character, not ethnicity, were what make a man. Douglass is as relevant to modern conservatism as Ronald Reagan is. His ideas were fundamental to the founding of the GOP. And we’ve allowed him to be lost to history when he offers us a road back to relevance with the constituency he so ably championed during his lifetime. It’s time for that to change. It’s time for Frederick Douglass to make a comeback.